A dynamic long-range planner and fundraiser, Daniel Sullivan led the College to expansion of its science structures and use of comput­ers for educational purposes. During his term the Col­lege re­turned to the semes­ter sys­tem with Satur­day classes abol­ished. A new liberal arts studies program for the freshman and soph­omore years was initiat­ed and progress made on additional athletic and physi­cal fitness ­facili­ties. Born on January 18, 1944, Sullivan grew up in Holley, New York. He graduat­ed from St. Lawrence University Phi Beta Kappa in 1965, with majors in mathe­matics and Eng­lish. He next attended Columbia Uni­versity, receiving a PhD in sociology in 1971. In that year he became assistant professor of soci­ology at Carleton College in Northfield, Minne­sota. In 1979 he was appointed Carleton’s dean of academic development and planning and, two years later, vice president for planning and develop­ment. He also served as secre­tary of the college and on panels and committees of the Nation­al Sci­ence Foun­da­tion, the Consortium on Financing Higher Educa­tion, and the College Board. In 1990 he would chair Project Kaleidoscope, a national effort to im­prove undergraduate education in mathematics and sci­ence. An athletic person himself, he found time to be a summer league soccer coach. While at Allegheny he sank ten baskets in a row during a foul shooting contest at halftime at a varsity basketball game. Sullivan set three priorities for Allegheny: faculty re­cruitment, student recruitment, and construction of new facilities. In the first area, initial progress resulted from improved salary schedules, an easing of the recruitment market, and vigorous effort. Enrollment reached 1,959 students, and a report labeled “Allegheny 2000” outlined campus needs. Nationally, alcohol abuse on campuses was a growing problem. Allegheny proved no exception. Steps were taken to improve counseling, and pressure was placed on the Greek system to be a more positive force on campus. Faculty and student calls for divestment of institutional funds invested in South Africa brought a debate with the Board, which by 1990 agreed to begin divestment. A Commit­tee on Racial Issues initiated by students and faculty spurred ef­forts to improve campus inclusiveness. A series of foun­da­tion grants supported a variety of programs. Change was rapid. Some faculty questioned the legitimacy and the implementation of new guidelines regard­ing tenure review. Students react­ed negative­ly to new room contracts, alterations in financial aid, and discontinu­ation of the wrestling team. They protested admin­istrative ac­tions during a key admis­sions weekend. Only 380 freshmen and just seven transfers regis­tered in fall 1990. The resulting shortfall in tuition revenue forced cutbacks. Moreover, fundraising did not keep pace with capital expenditures. Borrow­ing against the endowment was undertaken for a projected three-year period. The size of the faculty fell, and in 1991 a one-year freeze was placed on salaries. Two new science buildings opened (the Doane and Steffee Science Halls), assisting the chemistry and biology departments and the grow­ing environmental science program. Yet faculty remained restive over an abort­ed proposal to reduce payments to their TIAA–CREF pension funds and what, to many, seemed dispro­portionate emphasis on Allegheny as a “science college.” Many were also disturbed by the administration’s eagerness to jettison the long-standing teacher education program. Sullivan’s confidence and reliance on his staff and in data at times led him to accept policy recommendations and actions that might have benefitted from further review. He enjoyed creative debate, but others thought discussions tended toward the abrasive. The gap between faculty and adminis­tra­tive salaries raised eyebrows, especially as it became clear that debt prob­lems were rooted in ongoing sys­temic deficits. Undertones of serious disharmony murmured in the administration. There were posi­tive signs, as­ construction of the David V. Wise Sport and Fitness Cen­ter pro­ceeded and plans for new housing were implemented. Enroll­ment was recovering despite the decline of popula­tion in the Pitts­burgh recruit­ment pool. Important gender and racial issues on cam­pus were being con­struc­tive­ly ad­dressed, and on the na­tional scene Allegheny’s rank was mounting. 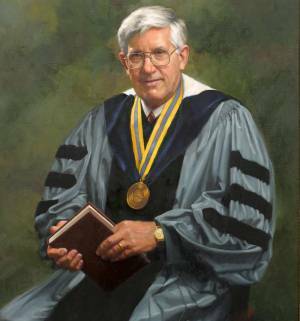 In 1996 Sullivan accepted the invitation of his alma mater to serve as its president. While at St. Lawrence he oversaw expansion of the curriculum and faculty and raised substantial sums. The student center was named for him, and he received honorary degrees from Clarkson and St. Lawrence. After thirteen years as the head of the university, he retired in 2009.